I like to re-post this item now and then because it’s so interesting–and so challenging to the Stupid Caveman model espoused by evolution-sellers. Let’s see a bunch of Gender Studies majors build something. Abydos in Egypt–does this look “lost” to you? I love archaeology. I’m fascinated by the distant past. So when I saw a headline that proclaimed “7,000-year-old Lost City Found” by Egyptian archaeologists, naturally I hastened to read the story ( http://www.independent.co.uk/news/world/africa/egypt-lost-city-found-luxor-a7435206.html ). Hmm… Egyptian history has long been written up as starting sometime around 5,000 years ago, so 7,000 is quite a long extension of it. Also, “Abydos” is a well-known ancient site nearby–as well as a town by the same name in Asia Minor. So “Abydos,” the name given to the lost city in the headline, was never actually “lost.” Maybe just misplaced. We are also told that Egypt’s tourist industry, since the fall of Hosni Mubarak and all that business with the Muslim Brotherhood, has taken a terrible hit. This discovery is expected to give it a much-needed boost. Hmmm… again. In all periods of history, there have always been groups of people who did not partake of civilization, even as there are today. I’ve been coming around to the opinion that the “cave men” that we think we know so much about were really just people who weren’t part of any civilization–and that whatever civilization might have coexisted with them has been largely erased by the passage of thousands of years. I’ve always wondered how what we call “civilization”–with buildings, writing, government, etc.–got started in the first place. If it’s “wired in” for us, why did it take so long to appear? And if it’s not, why did it ever appear at all? The Bible tells us that the descendants of Adam, once they were expelled from Eden, lost little time in getting cities built, creating a civilization that was wiped out in the catastrophe of the Great Flood. Another civilization arose after the flood, only to be knocked down when God confused human language when they built the Tower of Babel. So civilization comes and goes, and the ages roll on over its remains. Stuff only lasts so long. And then we’re puzzled when we discover something like Potbelly Hill in Turkey, or that wooden tablet full of indecipherable writing dredged up from a pond in northern Greece after 7,000 years at the bottom–discoveries that upset our preconceptions of the ancient world. Maybe this discovery in Egypt is on the level, and our preconceptions will take another hard knock. 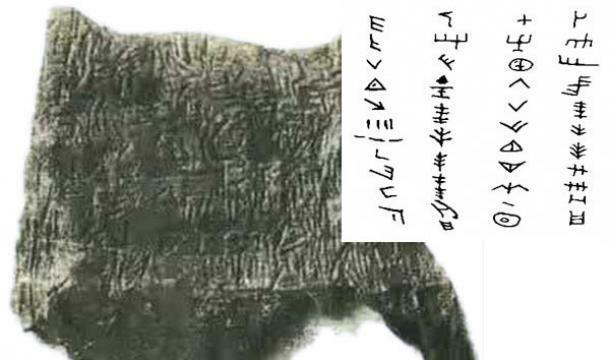 Here it is–the world’s oldest writing… that we know about, so far. See if you can decode the secret message. I hope you don’t mind taking a little break from watching our secular pin-head civilization destroy itself. When was writing invented? Back when they used to teach such things in school, we were told that the ancient Sumerians invented writing, possibly as long ago as 4,000 B.C. Egyptian hieroglyphics came along shortly afterward. Did you know that? I didn’t, and I try to keep close track of such things. This piece of wood, now called the Dispilio Tablet, is far and away the oldest known sample of writing. But of course we have no idea what it says. An unknown language written in an unknown script cannot be deciphered, as the saying goes. But we might have a slim chance of someday cracking the code, if the unknown language of the Dispilio Tablet is related to ancient Greek. For the time being, though, we have no way of reading it. Funny things are going on in prehistory, these days. There’s the Potbelly Hill site in Turkey, where a vast, sophisticated temple complex, complete with nicely-executed sculpture in the round, was apparently in operation around 10,000 B.C (see https://leeduigon.com/2013/01/10/an-archeological-enigma-potbelly-hill/ ). And now the advent of writing has been pushed back over a thousand years. If this keeps up, we’re going to run out of room in history for primitive, know-nothing cavemen. Although we can always find their like in some of our more expensive public schools.